We like the Saabaru because it combines cool Saab styling with the reliable and trusty Subaru Impreza wagon chassis. From 2005-2006 Saab sold rebadged WRXs as the 9-2X, the 'Aero' trim was the one to get because it came with a turbocharged engine and 2006 model year had a detuned STi engine. 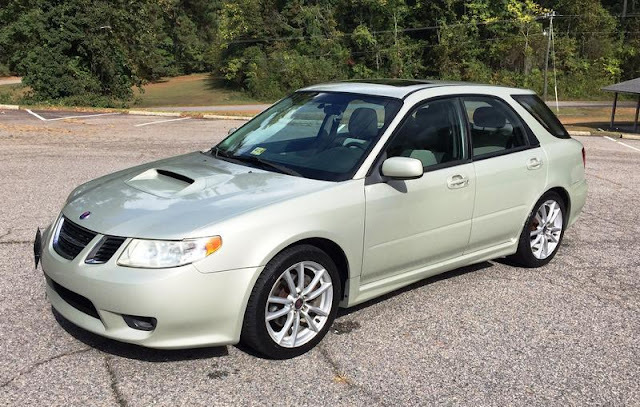 Find this 2005 Saab 9-2X Aero offered for $6,300 in Virginia via NASIOC forums. I have a baby on the way and need to sell my Saabaru. - This is your chance to own a well maintained and very fast "Saabaru". See below for background on this unique car. - Car needs nothing...I give it a 9 out of 10. - "Sensible" engine and suspension mods are listed below. So not only does it look great, but it has "Stage 2" upgrades making it very quick and suspension mods that make it handle like it's on rails. - Has a small door ding on driver's door, one on rear passenger door and a small one on the roof. - No rust anywhere. No leaks. - Tires are 60%, needs an alignment as there is more wear on outer edges of front tires. I may get it done if I have time. - Only 10,346 made between 2005 and 2006. - Mechanically, it's a Subaru WRX...hence they call it a "Saabaru"
Just don't get the one with the optional Demogorgon. I never pay more than $500 for a car with dents or body damage. Dents make a car look trashy and are expensive to have fixed, more than the car is worth. IMHO, if an owner loves his car, he has good, full coverage insurance and fixes dents promptly. And this car has "small door ding on driver's door, one on rear passenger door and a small one on the roof" indicating a less-than-meticulous driver. It all depends on the dents and the car. If you have a NSX you're interested in selling for $500 because it has a small door ding - I can't get there fast enough. As for dents, you say they are expensive to get fixed, but say that the original owner should get them fixed immediately, and you recommend they use insurance. Let's assume they have a typical full coverage insurance policy (not necessarily true for a car with over 160,000 miles), and likely a deductible. He has three dents - that's three separate claims. Each dent repair is anywhere from $150 to $850 depending on the dent and paint work required. So likely not enough to make the insurance claim worthwhile after paying the deductible, and we're not even discussing the future policy cost after making 3 claims. The car should be priced based on condition. If you want a car that is pristine, expect to pay more. A couple of dings is a great opportunity for negotiation. I'll take a great car at a reduced price with a few small dents any day. We all can't shop at the high end auction houses. The better looking twin of the WRX, IMO. These will always be an eye magnet for me, will always percolate those “maybe I could just...” momentary daydreams. I had a 2002 WRX wagon, and my son has this very model, only his is black. The seller should have pointed out the absence of the roof rack as a feature on the Saab version, which, along with the other body revisions, makes this car look much better than the Subie, IMHO. These are a great combination of fun and utility, and for buyers who like their pocket rocket performance with some of the rough edges sanded off, this is the one to get. So where do you get these serviced if it needs one of those complex cross systems repairs. The weird air conditioning/ antitheft/ coolant temperature/ transmission/ interaction in Volvos comes to mind. A Subaru store? A GM store? Or have the specialist tools and diagnostic software become generally available? I would think Subaru for everything except Saab-specific trim (bumper-caps, wheel-centers, etc.) It is my understanding that everything else is straight WAX. Matter of fact, I believe that was what ultimately killed it in the marketplace: Saab price, Subaru accommodations. *WRX, not WAX, you dopey autocorrect!! Of all the impotent badge engineering that has spewed out of GM, this one is very cool. The Saab badged version of the lumbering Chevy Trailblazer was tragic. Did GM at least go about this and have contests such as a "badge-a-thon" or "ugliest of show" contest?